Moving on...we're up to part five in our eight-part series on fragrance related holiday gifts. Today, we've got scented body products of all kinds, and as always, do add any of your own recommendations in the comments! From Golda, the Hiba Sphere Soap: "...our morning combination of Coconut, Palm and Olive Oils to help you rise and shine. With hydrating and conditioning properties from Jojoba, Avocado, Lemongrass, and Aomori Hiba essential oil, only found in 300 year old Aomori Hiba trees from Aomori, Japan. Our soap has a unique citrusy, cider-like fragrance that is purifying, uplifting, and stimulating." $18 for 126g at Studio Cue LA. From Clinique, Happy Gelato Cream: "Go ahead, indulge. This rich, soothing body cream is an all-over treat for skin. Leaves skin lusciously soft, lightly fragranced." Also available in Sugared Petals and Berry Blush, $35 each at Macy's. From Panier des Sens, Marseille Liquid Soap in Rose Geranium: "Rich in vegetable oils, olive and copra, this liquid soap gently cleanses and helps the skin to preserve its natural balance. Cooked in cauldrons, it is made in accordance with the traditional way of manufacturing Marseille soap." $16.40 for 500 ml on Amazon Prime. 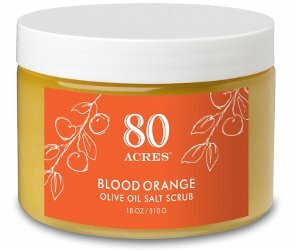 From 80 Acres, Blood Orange Olive Oil Salt Scrub: "Enriched with a blend of organic olive, sweet almond and jojoba oils, this pure and sensual fine grain Pacific sea salt scrub gently exfoliates and moisturizes leaving skin silky smooth and rejuvenated. With refreshing citrus essential oils and hints of neroli, vetiver and jasmine, Blood Orange evokes the citrus groves and wild jasmine that grow on the McEvoy ranch." $28 for 510g at CO Bigelow. 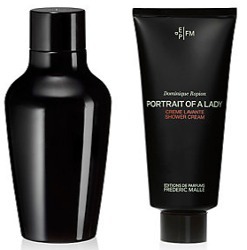 From Frédéric Malle, Portrait of a Lady in Hair & Body Oil ("Warmed in the palm of your hand, a few drops are enough to caress your body, instantly softening, hydrating and enhancing the skin"; $185 for 200 ml) or Shower Cream ("Shower and bath time are thus transformed into a splendid ritual where water, cream, scent and skin unite in a living, breathing Scheherazade – bold yet controlled, sensual yet strong, causing every head to turn"; $65 for 200 ml) at Barneys. 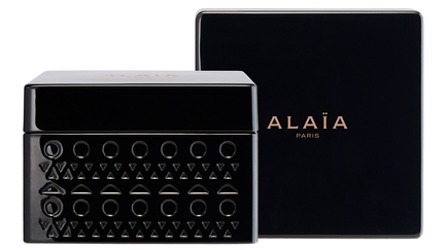 From Azzedine Alaïa, Alaïa Paris body cream ("Resolutely a modern creation with both cool and warm notes"). 200 ml for $105 at Hudson's Bay in Canada. From L:A Bruket, the No. 103 travel kit, with Bergamot Body Lotion, Lemongrass Liquid Soap, and Coriander and Black Pepper Shampoo and Conditioner, each in 60 ml. $40 at b-glowing. From Ortigia, the Holiday Gift Box, with eleven 40gm soaps (2 each of Bergamotto, Fico d'India, Florio, Geranio and Mandorla plus 1 Corallo). $78 at Fumerie. From Bath House, Mojito Cocktail Bath Salts: "The perfect gift for someone special who adores all things beautiful and the pleasure of luxury bathing. Our luxurious bathing salts create the perfect bathing experience. Sprinkle a scoopful into warm water to soften and scent with soothing citrus fragrance, lie back and relax." 350g for £10. And a stocking stuffer: Maja Talcum Powder, 100g for $7.50 at Smallflower. Of course it would! But it was too cute to leave out. Plus, my husband would kindly take a cleaver and cut it in half for me, which is what I do with any big soap. They are usually less cute afterwards but easier to use. I probably said this last year, and it isn’t actually much of a scented product, the the lip balms from For Strange Women make a wonderful gift. My husband just reminded me to order more because the one in my purse is reaching critically low levels, so I thought I would recommend them again. They’re waxy enough to last for hours on my lips and they don’t melt everywhere, are so lightly scented that they don’t drive me nuts, and they don’t go rancid quickly like lots of natural balms so I am fine if I loose one for a while. I have tons of lip balms, but these are the ones that I finish over and over and that Mr. Minion will purse-dive for (he HATES getting in my purse, for some reason). They’re packaged beautifully and come in tubes (my preference) or tins. Thank you! Which flavors do you love? Pine Cone and Rosewood are my favorites. I thought the Malle Hair and Body Oil was a cocktail shaker. That is some fine crazy perfume writing for the Malle Shower Cream. 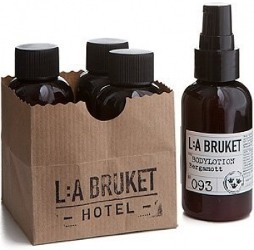 The L:A Bruket set is really cute. That little paper sack! You really ought to be able to repurpose that bottle! I hope Malle’s writer got a raise this year. I love that little paper sack. Not wrappable, though! Although maybe that’s another plus. I sometimes wonder who perfume writing is intended for. Are there actually people who can read that without cracking up? I think very few people read it carefully! 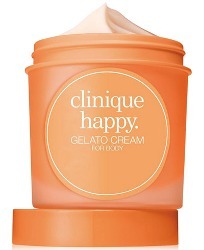 I would like the Clinique Happy Gelato Cream. The sugared petals sounds nice. I love a good body butter or body cream. They’re the best! Not a bad price, too. I like the Clinique Body Butter Cream. It is fragrance-free, very moisturizing, spreads easily and does not feel greasy at all. I would love to see the Marseille Rose Geranium Liquid Soap next to my sink. I hope it smells as pretty as the bottle looks. A nice surprise to see quite a lot of their products on Amazon. Panier des Sens is new to me, and so is Ortigia. The holiday soaps are calling to me, reminding me of the days when I had a family member who traveled to Europe regularly and would mule Roger & Gallet soaps in all the scents. Heaven. I always forget how much you can find at Amazon these days! I have tried Ortigia products, but not Panier des Sens. I’m eyeing the Marseille soap too. That is a reasonable price for elegance. 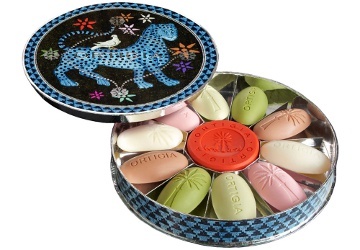 I am totally coveting that Ortigia soap tin. I came across it a week or so ago looking for gifts for someone. I decided she didn’t deserve it, and I couldn’t afford it. Not an entirely satisfying solution! I lusted after the Cowshed Advent Calendar but since that was not available, I decided to get a bunch of stuff during Black Firiday @ 25% off, including a trio of travel-sized hand creams boxed and decorated enough for instant gift-giving or break up the set to spread the fun. I am giving my mom a 3 piece gift box of Garofano soap from Santa Maria Novella. This soap smells so good that I wish I could keep a bar for myself which is a bit greedy considering I already got myself a bar each of Melograno and Vetiver. I love SMN soaps, they are my favorites. Great gift for your mom. Lovely choice! How is the vetiver? I haven’t used it yet but it smells amazing through the paper. I am not sure if it smells 10 euros good but hey, I was on vacation and SMN is a heck of a lot more expensive on this side of the pond. Nice balance of choices, the Rose Geranium soap is calling me. I would like to add a find I’m enjoying, SJP Stash elixir which is a nicely scented oil “for hair and body.” I’m still playing around with how to use it, so far I just mix it with a little lotion/styling mousse. The gift set, a bottle of elixir with a 1.7 oz bottle of Stash, is on sale at Ulta right now for 38.50, nice deal since the elixir alone is $55. be checking some of these out- right after I finish watching Mr. Church. Wow. Tear jerker but beautiful movie! Thanks, will have to look up the movie! 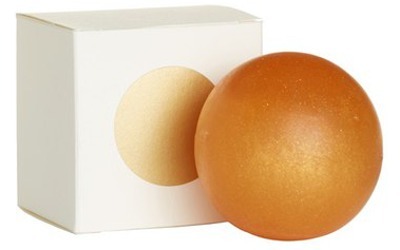 I’m wondering if Golda’s Hiba Sphere is meant to smell like cedar rather than cider. Hiba being an evergreen tree and all… just saying. I have to confess that I already bought myself the PoaL body oil. I sort of knew I would as soon as I heard about it.